Amazing Rosacea Creams Use Unique Anti-Bacterial and Anti-Inflammatory Marine Ingredients to Sooth, Firm and Heal Rosacea-Prone Skin. Do you suffer from facial redness, red bumps, or even acne-like pustules on your skin? Do you sometimes suffer pain, itching or dryness of the skin of your face along with the redness, bumps or pustules? Do these undesirable problems cause you embarrassment and frustration and even affect your social and/or professional life? 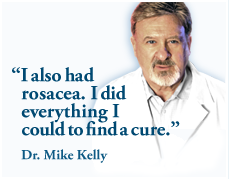 If so, you probably suffer from rosacea. Transform Your Rosacea-Prone Skin and Eliminate the Red Face, Bumps on Face* and Other Symptoms of Rosacea with a Revolutionary Rosacea Treatment from the Sea! The active ingredients in Natural Rosacea Treatment Creams are unique natural products from the sea which means you can capture the natural healing powers of the sea to control your rosacea.